EVA Foam Adjustable Visors - 6 adjustable positions, 1 size fits all. Ideal for children & adults. Soft peak is ideal for contact sports to avoid eye damage to other players. 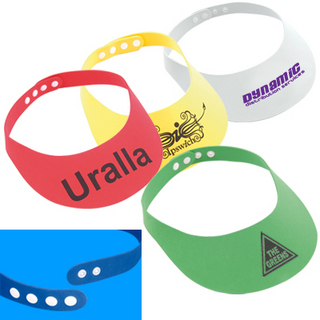 Great at the beach or the pool Choose colours to indicate teams for sports events. Colours available - white, yellow, green, red, blue. Decoration - print.